What was Henry Kissinger's role in formulating US foreign policy during the Nixon Administration? Henry Kissinger, one of America's most controversial foreign policy advisors, has been lauded for his many accomplishments during his tenure as National Security Adviser under President Nixon and Secretary of State for both Nixon and President Ford. He is credited with some for "thawing" US diplomatic relations with the Soviet Union during the Cold War, and he helped to bring about the end of American intervention in Vietnam. Kissinger's successed in foreign policy, however, have also arroused much criticism. In fact, many of his critics accuse him of war crimes. 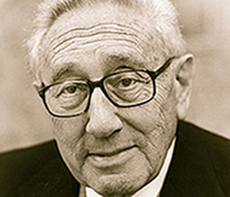 Kissinger, a German Jew, was born on 23 May 1923, in the Bavarian city of Fuerth. His family immigrated to London in 1938 after it had become clear what Hitler's intentions were. The family then moved to New York city. Kissinger attended high school at night and worked in a factory during the day. While attending City College of New York in 1943, he was drafted into the Army, where he began his public career as a German interpreter. After Germany surrendered in 1945, he held a variety of positions within the military government. Once Kissinger was discharged from the military, he attended Harvard University, where he earned his B.A. with highest honors in 1950 (and subsequently his M.A. and Ph. D. by 1954). By 1962, Kissinger was working as a professor at Harvard University and consulting closely with the Council on Foreign Relations and Governor Nelson Rockefeller. His resultant body of work was published in a book , Nuclear Weapons and Foreign Policy. This book helped establish his reputation as a foreign policy scholar. In his book, he introduced the idea that America's success abroad depended not just on its military strength, but also on its ability to recognize and respond to aggression. When Richard Nixon was elected president in 1968, Kissinger was brought into the administration as National Security Advisor. Later he was appointed to be Secretary of State, a term he held through both the Nixon and Ford administrations. During his term as Secretary of State, Kissinger played a major, albeit secretive, role in diplomatic relations. His secret trip to Beijing in July 1971 prepared the way for Nixon's visit to China in February 1972 which has been credited with opening frozen relations with the People's Republic of China. His behind-the-scenes work allowed him to negotiate the Paris agreements of 1973, which ended direct U.S. involvement in the Vietnam War and earned him the Nobel Peace Prize alongside Le Duc Tho, a North Vietnamese peace negotiator. As an admirer of the principles of realpolitik, Kissinger was able to coordinate a short term period of détente with the Soviet Union, leading to the Strategic Arms Limitation Talks and the Anti-Ballistic Missile Treaty. In 1973, he negotiated the end of the Yom Kippur War, which began with Egypt's invasion of the Sinai Peninsula and Syria's invasion of the Golan Heights. Later, with his help, a peace treaty between Egypt and Israel was reached in 1979, after the Camp David meetings brokered by President Jimmy Carter, in 1978. Kissinger left office when President Jimmy Carter defeated Ford in the 1976 elections. He later continued to play a minor advisory role in the Reagan and Bush administrations and participated in policy groups such as the Trilateral Commission. In 2002, he was appointed to chair a committee by President George W. Bush to investigate the events that led up to the September 11 attacks. Criticism from across party lines, partially due to his past secrecy towards the public and his refusal to provide financial disclosures, caused him step down as chairman in December 2002, citing a conflict of interest with his clients. Henry Kissinger continues to work, speak, write commentary, and take an active role in public life through his consulting firm, Kissinger and Associates. 1938: Moved from London to New York with family to escape Nazi Germany. 1943: Drafted in Army, served with U.S. Army Counter-Intelligence Corps as a translator. This is the year Kissinger also became a naturalized U.S. citizen. 1954: Earned his Ph.D. in International Relations from Harvard University and began a career as a Harvard professor. 1969: Appointed Assistant to the President for National Security Affairs by President Richard Nixon. This is the year he also became the head of the National Security Council and the U.S. military conducted air raids in Cambodia without Congressional knowing or approval with permission of Kissinger and Nixon, intended to repel North Vietnamese forces, which were advancing over into Cambodia. Hundreds of thousands of civilian deaths followed. 1971: Kissinger's secret trip to Beijing paved the way to reestablishing relations with China. Subsequent visits by Nixon established negotiations. 1972: Negotiated the Strategic Arms Limitations Talks (SALT) agreements with the Soviet Union. Prompted a short period of detente. 1973: Kissinger became the 56th Secretary of State under Nixon. Paris treaties led to Vietnam cease-fire pact which lead to the U.S. withdrawal. Awarded the Nobel Peace Prize. Helped with negotiating the end of the Yom Kippur war. 1975: President Ford and Secretary of State Kissinger met with President Suharto of Indonesia; giving approval for the invasion of East Timor, leading to the death of an estimated 200,000 civilians. 1977: Kissinger exited office after President Carter's election. Began new career as professor of diplomacy at Georgetown University's School of Foreign Service. 1978: Started Kissinger Associates, to continue his work with foreign affairs. Kissinger Associates works with businesses and governments on a consultancy basis. 1980: Won American Book Award for his memoir entitled The White House Years. 1983-1985: Appointed to chair the National Bipartisan Commission on Central America by President Reagan. 1984-1990: Served on Foreign Intelligence Advisory Board for Presidents Ronald Reagan and George H. Bush. 2002: Kissinger appointed to head a government inquiry into the terrorist attacks of 11 September 2001. The next month Kissinger stepped down, citing potential conflicts of interest due to his private political consulting firm. The Beijing-Washington Backchannel and Kissinger's Secret Trip to China: George Washington University's archive of declassified DOS documents from Henry Kissinger's secret trip to China. The Nobel Peace Prize 1973: The Nobel Peace Prize for 1973 website including the transcripts from Kissinger's acceptance speech. East Timor Revisited: Documents concerning Ford, Kissinger, and the Indonesian invasion, 1975-1976. New information on the politics and standpoints involved in this action from the archives of George Washington University. Henry Alfred Kissinger, Secretary of State: Biography and notes on the travels of Henry Kissinger during his tenure as Secretary of State, from the Department of State website. Nixon's China Game: This website is a supplement to the PBS documentary on Nixon's secret negotiations with China and the events that led to the end of the Vietnam War. It contains multimedia information on Kissinger and other administration officials involved in negotiations. The Cold War Digital Library: Memos, graphics, transcripts and photographs from the Cold War, from Academic Info's Cold War Digital Library, including information on the Bay of Pigs Invasion and the Cuban Missile Crisis. American Radioworks: The President Calling: Transcripts and photographs explaining the events that led up to the Watergate scandal and uncovering of the secret bombing of Cambodia. There are many telephone transcripts between Kissinger and Nixon available from American Radioworks. Timeline of the Vietnam War: Timeline of the Vietnam War from PBS. Well done. Nixon Presidential Materials: Provided by the National Archives and Records Administration, this resources contains historical materials created and received by the White House during the administration of President Richard M. Nixon, in accordance with the Freedom of Information Act. The Trials of Henry Kissinger: Website for the documentary, The Trial of Henry Kissinger, in which journalist Christopher Hidgens presents evidence that he believes should make Kissinger liable for war crimes. The website itself contains links to supporting articles, photographs, and online research that supports this point of view. Current Kissinger News: Henry Kissinger remains a public figure and the media often quotes and profiles him. You can use Google's news spider to locate current news articles from newspapers, magazines, and websites across the world concerning Kissinger. Does America Need a Foreign Policy? : Speech transcript from a gathering in 2001 hosted by the Commonwealth Club discussing contemporary foreign policy. Henry Kissinger, Former Secretary of State, at the National Press Club: Listen online to Kissinger as he discusses his years of service and experience in foreign relations. The Ashbrook Center: Transcript from a 1997 speech where Kissinger discussed his decisions while Secretary of State under Nixon and Ford. This page is copyright © 2006, C.T. Evans and M. Brewer.